I was on the front porch this afternoon doing some work when I happened to look up and notice a dragonfly just outside one of the windows. It made me smile because I have a special place in my heart for dragonflies. But it didn’t fly away or land. It just kind of hovered outside the window. As I watched it, the hovering seemed rather unnatural and odd. I began to suspect it was caught in a spider web and got up to take a closer look. Then I noticed the dragonfly begin to spin fast and also noticed a tiny spider a few inches above it spinning its arms like a masterful puppeteer. (Honestly, it reminded me of Voldemort in Harry Potter.) Clearly, this dragonfly was in a deathtrap and in the process of being bound, paralyzed, and eventually having the life sucked out of it by the hungry predator it was now powerless against. Well, with all due respect to spiders and their fantastic webs, this was not going to happen on my watch! I was not about to stay put and watch a beautiful dragonfly become a lifeless shell of its former, dazzling self. No siree! Not knowing if it was too late, I grabbed a long object (since the web was higher than I could reach), bolted outside and batted at the web until the dragonfly became detached from the spider and the web. The binding process had only just begun, and I saw that there weren’t many sticky threads attached to the dragonfly yet. So I picked it up and brought it inside to inspect it. There were bits of sticky web and binding threads caught on its delicate wings and legs, and I began to remove them ever so carefully, knowing not to touch its fragile wings. The dragonfly stayed with me for about a half hour as I tended to it and gave it all the love I could. Every now and then, it flew away only to drop to the ground because there were still some threads attached that restricted its movement. Eventually, I managed to get the last bits of spider web off, and the dragonfly flew out of sight. This little creature must not have realized how close it was to danger. Then it got caught in the web that at first sight probably didn’t look so dangerous. It got too close, got stuck, and couldn’t break free. It must have been terrified when it realized how sticky the web was and how powerless it was against it! And then the very hungry and merciless spider sprang into action. At that point, I imagine the weak dragonfly gave up hope that it ever could break free from the situation and probably thought: What’s the use? I’ll never be that brisk, shimmering being again. But even in your bleakest moment, you never know who’s looking out for you – who will step in and act on your behalf and watch over you as you recover from the trauma and clear the sticky debris from your wings…because even though you are a tiny dragonfly, YOU MATTER. The point is: Don’t give up. Even when the situation seems hopeless, and all odds seem to be against you, somebody just might be looking out for you, ready to take action to help you get your wings untangled from the web that seemed so impossible to release yourself from. You might even have a guardian angel working behind the scenes, perhaps in response to a loved one’s prayers for divine intercession. I don’t know how these things work, only that the dragonfly wasn’t paying close enough attention and ended up in the web, and I happened to notice at just the right time. I often wonder if trees experience time the same way humans do. If so, I imagine being rooted in one place for such a long time would feel like eternity! But I suspect time moves more quickly for trees and probably more slowly for dragonflies, whose lifetimes are so brief compared to humans. That half hour in my care (not to mention the time it was caught in the web) might have felt like years to the dragonfly. Perhaps it felt like a very long time for it to recover from its brush with death in the spider web and rid its wings and legs of the sticky debris so it could once again fly right. Perhaps it required patience – the trying, the falling, the humility of it all, and having to give it a little more time before trying again. I like to think that when it finally did fly off – perhaps back to its dragonfly family – it did so a little wiser as a result of what it had experienced, with greater knowledge of the nature of spider webs, what to look out for, and how to avoid them in the future. 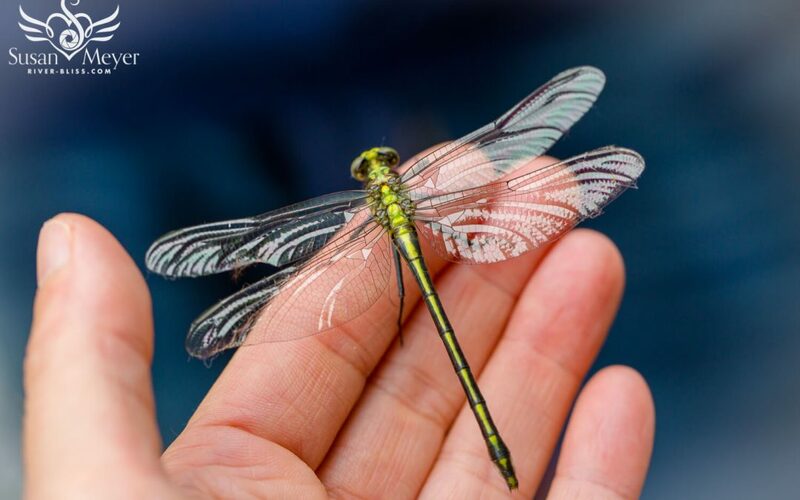 Perhaps the dragonfly flew off with a renewed sense of purpose, a better understanding of its strengths and resources, and a realization that there is goodness in the world and that it is loved deeply. Thank you, my little dragonfly friend, for giving me this parable. I hope you are zipping around again, feeling loved, and sharing your survival story with all your dragonfly friends. And I’ll share it with mine because it is a story of hope, and I know quite a few people who could use a little of that right now.